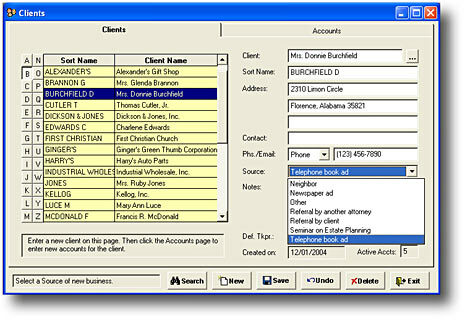 Multiuser Verdict 10 is based on Verdict 10 and includes all the features of standalone Verdict, along with the unique ability for many users to concurrently access the same system. With Multiuser Verdict, every secretary or timekeeper can post directly to client accounts, based on their assigned security level. One of the biggest advantages of posting directly to a multiuser system is the automatic checking and confirmation of data. If the account number doesn't exist or the timekeeper initials are not in the system, you are told right away. Another advantage is that there is no delay in having an up-to-the-minute status report on a client account because all time, expenses and payments are posted directly to accounts. And an account can be reviewed from any workstation on the network. You can see how nice it is to have a multiuser system and Multiuser Verdict. Multiuser Verdict 10 supports an unlimited number of timekeepers and either 3 or 10 simultaneous users in its base configuration. (additional users can easily be added by purchasing an additional user license from Micro Craft). Multiuser Verdict 10 requires a Windows 2000 or 2003 server or peer-to-peer network. Highly recommended is a server running at 1 gigahertz or higher. Bills and reports can be printed on any Windows-compatible laserjet or inkjet printer.